As moms, wives, and entrepreneurs, we need to continually learn from others as well as to get and give support so we can fulfill the greater purpose God has for our lives. I am in three different, great support groups right now (one is a mastermind) and lately we’ve been discussing how as Christian women, we daily face Satan’s attacks against us to distract us, cause us anxiety, stress us out, oppose our growth in God and our business success, or outright wipe us off the face of this earth. Satan is that thief, and he’s doing everything he can to come against the women who are passionately pursuing God, and who desire to make an eternal difference here on earth with their lives and their gifts that God has given them. But God is greater than any demon in hell. He will give you victory if you just trust and have faith. Right now I am offering an exclusive 25% discount off the price of my new ebook to everyone who signs up on my update list. 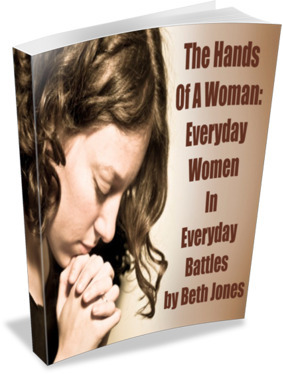 This ebook is about women and spiritual warfare. Eight women share powerful stories about some of their worst spiritual battles, and about how their faith in Jesus Christ brought them through to the other side. When you sign up for the update list, you’ll receive a free special report, 6 Tips For How To Find and Fulfill Your Great Purpose, and you’ll be able to get the special discount on my newest ebook, The Hands Of A Woman: Everyday Women In Everyday Battles, before the ebook is for sale here at Tablet of My Heart. This is a limited time only sale! Remember, God is greater than Satan, and the battle belongs to the Lord!